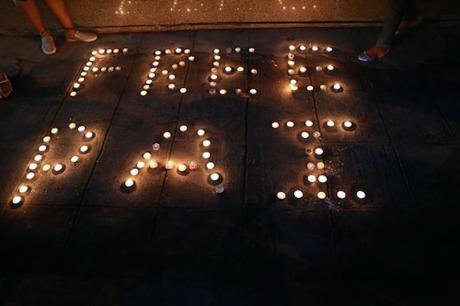 Candles at a protest against the detainment of activist Jatupat Boonpattararaksa. Credit: Prachatai English.In the last three years of military rule in Thailand, arrests and prosecutions for defamation, sedition and offences under the Computer Crimes Act have soared. Human rights advocates, democracy campaigners and ordinary citizens have been threatened, harassed and detained in military camps. The junta have sought to silence public discourse on every conceivable aspect of their rule. Global social media platforms are ground zero in this repression, and each month citizens are arrested and detained for what they post, share and like on Facebook. 285 people have been investigated for insulting the monarchy in the last 3 years.Following the military seizure of power in 2014, the 18th coup in Thailand’s short history as a constitutional monarchy, there has been a sharp increase in the number of prosecutions for royal defamation, (the crime of lèse majesté) and sedition, and an increase in the severity of punishment for those found guilty. Days after a record prison sentence of 70 years (halved to 35 for a guilty plea) was handed out to a Chiang Mai man convicted of lèse majesté for a Facebook post deemed defamatory, the office of the UN High Commissioner for Human Rights made a statement condemning the spike in defamation prosecutions. The figures it reported are grim: 285 people have been investigated for insulting the monarchy in the last 3 years, more than double the number in the period between 2011 and 2013. A sharp fall in the proportion of those accused able to defend themselves successfully was also reported, from 24% between 2011-2013 to 4% in the previous year. A spokesperson for the military government stated the reason for the increase in prosecution rates was the growing number of online offenses where convictions were supported by retrievable computer evidence. This hardly tells the whole story. Under the military junta online surveillance and censorship have been aggressively pursued in a context of “unchecked and unaccountable” military executive power. The military junta’s ever evolving efforts and capacities to control online communication, as documented by this Citizen Lab report, are assisted by royalist far-right cyber-vigilante groups, some state sponsored, some self-organised, scouring Facebook and other popular online spaces for content and activity that could be construed as defamatory. What users are alleged to have done on Facebook has been front and centre of recent prosecutions for insulting the monarchy. What constitutes an insult under Thailand’s defamation laws is notoriously resistant to concrete elaboration or public discussion. Lèse majesté prosecutions under Article 112 of the penal code have been used routinely and extensively by successive military (and civilian) governments to engage in political cleansing of opposition and dissent. As arbitrary as these prosecutions are they display a disturbing pattern. As Katherine Gerson of Amnesty International puts it in her contribution below, Facebook is a hunting ground for the junta to collect evidence that is subsequently used to harass, persecute and convict peaceful civil rights and democracy activists and their relatives. One symptom of the intensified defamation frenzy and paranoia is that there has been a rapid escalation in the kinds of activities on Facebook proscribed by the junta, from ‘public’ comments to private messages between users, from posting to merely sharing, liking, following or viewing material deemed inappropriate. This month a closed military court is hearing the case of Patnaree Chankij, a domestic worker from Bangkok accused of insulting the monarchy in a private Facebook chat message. Patnaree, the mother of a prominent activist associated with the Resistant Citizens group, was arrested and bailed a year ago after responding to a message from another user deemed insulting with the single word, Ja, a word, variously translated as ‘right’, ‘I see’ or ‘okay’, a participle which acknowledges an utterance without necessarily implying agreement. The sender of the chat message, an activist from the Northeast, Burin Itin, was prosecuted for lèse majesté and sentenced to more than 11 years in jail. A police statement issued at the time of the arrest clarified that Patnaree was being charged for failing to rebuke the sender of the defamatory message, a sin of omission or lèse majesté by silence, as one commentator put it. Meanwhile, a law student and activist in the Northeastern city of Khon Kaen, Jatupat Boonpattararaksa, also known as Pai, has spent six months in remand prison charged with lèse majesté for sharing a profile of the new Thai king translated and posted on Faceboook by the BBC Thai Service and shared thousands of times. Pai, a target of the military junta for his association with student human rights and democracy group Dao Din, has the grim distinction of being the first Thai citizen to be charged with lèse majesté under the reign of the new monarch. These are two among the dozens of cases documented by Amnesty International where military authorities have used defamation law to target members of civil society organisations engaged in peaceful activities. 'Emergency’ decrees... have given sweeping powers to the army that have been used to harass, intimidate, detain and persecute the junta’s critics without judicial oversight.If investigations and prosecutions under Articles 112 and 116 (sedition) have increased since the 2014 coup these are frequently coupled with charges under the Computer Crimes Act. Introduced by the previous military government in 2007 and amended in 2016, the Computer Crimes Act was widely criticised by international human rights organisations, not least for creating a category of criminal offences which could be used to dramatically restrict freedom of expression, concerns that have proven to be well-founded. Among the more notorious of the legal provisions are Article 14 which punishes the inputting of "false data" that is "likely to damage the maintenance of national security", or cause "panic in the public". As critics have pointed out, ‘false data’, ‘national security’ and 'public order' are vague and ill-defined abstractions that lend themselves to arbitrary prosecution. The Computer Crime Law allowed officials at the ICT Ministry to apply for court orders to seize computer equipment and block websites, providing a legal basis for internet censorship. Amendments to the Act passed in 2016 established a computer data screening committee tasked with monitoring content that, whilst not illegal, was found to "violate the public order or moral high ground of the people." Additional ‘emergency’ decrees issued by the junta since the coup have given sweeping powers to the army that have been used to harass, intimidate, detain and persecute the junta’s critics without judicial oversight. In Thailand, as David Streckfuss has argued, a state of exception, characterised by the suspension of the normal regime of law is a permanent reality. A permanent state of exception has been created by the recurrent cycle of military coups, each of which abolishes the existing constitution, and ushers in abnormal measures which empower the state to act with impunity in dealing with apparent threats to security and order. But a state of exception is also entrenched, nurtured, and extended by what Streckfuss calls a defamation regime, a polity characterised by widespread criminalisation and punishment for defamation crimes. In such a regime, defamation actions cultivate the permanent sense of threat or crisis that require the state of exception to become the rule. The terrible costs of this defamation state of exception can be counted in the number of its victims imprisoned by the junta for peaceful and innocuous actions. More broadly, as Streckfuss poignantly puts it, a defamation regime is one in which the elevation of reputation and correspondingly diminished concern with truth as a criteria of judgement in the public sphere has crippling consequences for the social and political imagination. A defamation regime is one in which... diminished concern with truth as a criteria of judgement in the public sphere has crippling consequences for the social and political imagination. What is the role of the corporations that provide the services, platforms and infrastructures of online communication in Thailand’s defamation regime? How do these corporations interact with the military junta? To what extent do they facilitate and enable Thailand’s defamation regime and its human rights abuses? Another widely condemned measure in the Computer Crimes Act, introduced by the previous military regime, was the extension of criminal liability to internet service providers and content providers for intentionally or unintentionally enabling illegal activities, such as posting ‘false data’ that threatens national security and public order. The effect of intermediary liability coupled with mandatory SIM card registration has been to introduce what Pirongrong Ramasoota calls an ‘architecture of identification’ at the point of access to internet services. Not only that, it has effectively outsourced and distributed surveillance and pre-emptive censorship activities to private companies, incentivising service providers to intensify their monitoring of users and their use of information controls such as filtering. A recent Privacy International report on surveillance in Thailand reported a culture of close, informal and mutually dependent relationships between key internet service providers and the military establishment as another modality of control. The junta relies on what the report calls a ‘door knocking strategy’, in which ISPs, including companies with strong links to the military like True, owned by the conglomerate Charoen Phokphand willingly and discretely cooperate with requests to block websites. The military authorities also bring companies outside of this charmed circle into line by threating to use their power as de facto regulators to rig spectrum auctions so as to exclude more independently-minded ISPs from the market. Eva Blum-Dumontet of Privacy International (see below) relates the case of DTAC, a Thai subsidiary of the Norwegian telecoms corporation Telenor, which exposed the opaque protocols of the door knocking strategy by publicly confirming that it had received an order to block access to Facebook in the aftermath of the coup on 28th May 2014, an order previously denied by the junta. Telenor was then criticised by the industry regulator, the National Broadcasting and Telecommunications Commission (NBTC), which issued threats to review DTAC’s compliance with laws on foreign ownership of telecoms companies. With one eye on upcoming spectrum auctions Telenor subsequently back-pedalled, issuing an apology to the NBTC and the military junta and replacing the chief executive who had gone public with one with a ‘better understanding of the Thai context’. Here Telenor’s principles, its commitments to transparency, freedom of expression and privacy as a member company of the Telecommunications Industry Dialogue appeared to come into direct conflict with its more immediate commercial interests. The military junta have experimented with a range of approaches to exert their influence over corporations including Facebook and Google.What about the global corporations that operate the content platforms where defamation crimes are alleged to take place, whose servers and company headquarters are based outside Thailand? The military junta have experimented with a range of approaches to exert their influence over corporations including Facebook, Google (as owner of Youtube) and the messaging service LINE, which is phenomenally popular in the kingdom. In the aftermath of the 2014 coup the Junta established a Media Reform working group that made overtures to meet with and secure the cooperation of these corporations in monitoring and blocking content deemed defamatory and providing access to user data. In the period immediately following the death of King Bhumibol Adulyadej in October 2016 ISPs and social media administrators were again ordered to actively monitor and block offensive content. Google it has been claimed agreed to establish a team in the US, including Thai nationals, that would monitor ‘undesirable’ content. The geo-blocking of the Charlie Chaplin movie "The Great Dictator" on YouTube recently, in response to a legal complaint from the Thai government, raises troubling questions about how Google responds to requests. Both YouTube and Facebook have found geo-blocking to be an effective way of squaring their commercial interests with the demands of the junta. 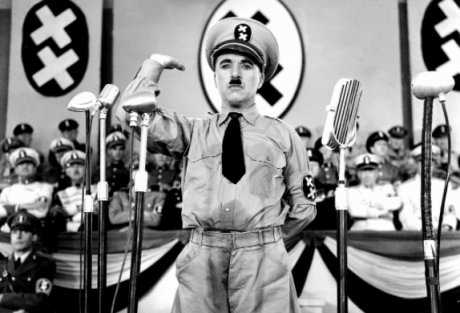 Charlie Chaplin in The Great Dictator. Youtube. Fair use.Facebook has designed its policies, such as the use of verifiable names, without consideration for users in authoritarian regimes where freedom of expression is severely curtailed. Latterly, as royal defamation paranoia has intensified the junta has changed tack, threatening prosecution if requests to block content alleged to be defamatory are not met. Last month the military government ordered Facebook to block access to 309 pages within Thailand. Facebook, in turn, pointed to its policy which states the company will only take action in relation to formal requests from governments where these are supported by court orders, on that basis it took no action on 131 of the pages. The head of the regulator then reportedly made belligerent threats that Facebook would be charged under the Computer Crimes Act if it failed to comply, apparently unaware that no court orders had been submitted in the outstanding cases. It was also reported that the junta were putting pressure on the Thai Internet Service Provider Association to immediately block access to Facebook if it failed to comply. In the event, court orders were supplied for the majority of the remaining web pages and Facebook complied. But in a context where the independence of the courts has been eviscerated the military junta can, as the Thai Political Prisoners blog pithily put it, order up a court order as easily as a takeaway pizza. This, the blog concludes, "makes Facebook a pawn in the hands of governments both legitimate and illegitimate." Below Orapin Yingyongpathana makes the broader point that Facebook has designed its policies, such as the use of verifiable names, without consideration for users in authoritarian regimes where freedom of expression is severely curtailed. Even so, it appears that the military junta have limited tolerance for Facebook’s procedures, operating as they do beyond its immediate grip. In early July, a senior representative of the NBTC threatened new control mechanisms for Facebook and YouTube, that would redefine them as broadcasters and consequently subject them to Thai broadcasting regulation and licensing. Major Thai brands and companies were warned to expect consequences if they advertised on what would be illegal, unlicensed platforms if they failed to comply. No sooner was this threat issued than it was partially withdrawn, or rather put on hold. What is beyond dispute is that the junta are actively seeking more extensive surveillance and control over expression on social media platforms. As Arthit Suriyawongkul observes in the clip below, the difficulty of holding Facebook and other global social media giants criminally responsible as intermediaries under the Computer Crime Act is motivating the junta towards control mechanisms which operate at a deeper network level. These efforts will no doubt be directed by the new National Cyber Security Committee, to be headed by the Prime Minister Prayut Chan-ocha, which will be created when the Cyber Security Bill passes into law, as is likely next year. Critics have argued that the Act gives the Cyber Security Committee the power to access private communications of anyone it suspects without court approval. The prospect of a Committee with the remit to exercise its powers beyond the law ‘in cases of emergency’ is another reminder of the permanent state of exception that exists in Thailand. The following are a series of four panellist contributions to the Silencing Dissent event hosted at Goldsmiths, University of London by the Internet Futures and Human Rights Research Hub. Orapin Yingyongpathana is editor of the independent Thai news and current affairs website The Momentum. She has worked as an advocacy officer for the South East Asia Press Alliance (SEAPA) and for iLaw, an NGO focused on public participation in law and legal policy which established the Freedom of Expression and Documentation Centre. Arthit Suriyawongkul is a coordinator for Foundation for Internet and Civic Culture, also known as Thai Netizen Network. He works on digital civil rights and public participation in internet policy. Katherine Gerson is Campaigner on Thailand at Amnesty International. She has previously worked on Myanmar, Malaysia, Singapore, Philippines, Brunei, India, Nepal, Bhutan and Sri Lanka for AI. Eva Blum-Dumontet is a researcher for the London-based charity Privacy International, where she conducts research on surveillance and data intensive systems with a focus on South America, North Africa and South East Asia. She is the author of several reports on surveillance in Thailand and of an investigation on the Egyptian intelligence services. This article and the series of audio clips that follow come out of a roundtable discussion, Silencing Dissent: Social Media and the State in Thailand hosted by the Internet Futures and Human Rights Research Hub at Goldsmiths, University of London in June 2017.